Home » Gardening » Rooting Cuttings Successfully in Sand. In this post I want to show you how easy it is to root cuttings in sand, using the techniques that I recommend. Every week during during the growing season we try and shoot a “Mondays with Mike” video for our members. The videos that we shot in the last 30 days show how easy rooting cuttings successfully in sand really is When You Use this Strategy and Equipment. This first video was shot on or around June 10th, 2014 and at that time you will see my sand beds ready for cuttings, but at the time of this taping we hadn’t stuck a single cutting yet. In this next video, you’ll see that our cutting bed is about halfway full. This video was shot on June 20th and talks a bit about how important it is to make sure that there is some overlap in your mist spray. This third video was taped on July 2nd, 2014. In this video you will see the cutting beds almost full of cuttings and you will also see many cuttings already rooted. Without a doubt, this process works! My hazelnut trees have been eaten by caterpillars. I tried BT, but they still come back. Is there anything that will get rid of them? HELP! They have eaten the trees down to the bark. You might need an insecticidal spray. Plenty of them on the market at any garden store. Sevin dust will do the trick. You can get it just about anywhere. Wal Mart even has it. It’s about $5 for one can or $12 for 3. Dust the powder on the entire plant, trunk, leaves (when you get more) and the soil. I even put some on the ground around the pot if it’s in one. If it rains or you water and it washes away, reapply it. Have hazelnut trees that have been attacked by catterpillars. I tried BT spray, but they cme right back. They have eaten 1 tree right down to the bark. HELP! Is there anything that will stop them? Do you ever use heat mats under the softwood cuttings? Ive seen videos of small scale propagators doing so and wondered if it is something you had an opinion of either way. I am growing some bonsai from several types of trees and always expanding, would love to win a lifetime membership, my mom referred me to your site. Hi Mik. I’m totally new at this. I live in Southern California and I am having a hard time with rooting.some of my plants. They are wilting and have yellow leaves. 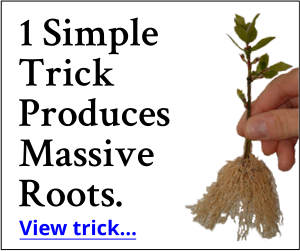 May I ask you what you specifically use for rooting compound for your plants? And if some compounds work better for certain plants? I’m very excited to get on the right track as I really think I can be successful at this, even with my sometimes black thumb! Thank you so much. Mike, you make rooting tens of thousands of plants so easy. I love your ‘sand box’. Last year was the first time I used a cold frame (Wooden box frame w/storm window hinged on top). I lost a lot of rooted cuttings due to lack of water. When do you turn off your misters for the winter? How do I keep the proper amount of moisture in my cold frame in the winter? I shut off my automated irrigation as soon as my cuttings are rooted. If you still have stuff that is not rooted just leave it on until you expect a freeze then shut it down. You just have to water as needed. I don’t think it’s possible to say how much or how often, way too many variables. The rooting medium just needs to be moist, not soaking wet. I Love your knowledge Mike! I live in zone 9b (So Cal) I planted 2 Lavender Twist Weeping Redbud Trees and they seem to be growing well considering the drought we’ve been in for too long now, however, the leaves are getting burnt from the sun/ heat? Anything I can do to help them? They have good drainage and water. Also, I’m not sure about their root system, as they’re planted about 11ft away from the house and 6ft from the edge of driveway. Any suggestions would make my day! I don’t think I’d be overly concerned with the tree roots, just keep the trees trimmed so they don’t get too wide for the area. Zone 9B is pretty warm for a deciduous plant so I’m not sure you can do much about the leaves except to make sure the roots have enough water during the heat of the day. Do not fertilize them, the last thing they need is nitrogen when they are under stress from the heat. I think they’ll be fine. Mike I love your videos. I have an area that is about 30″ x 15″ that has small washed stone in it. I want to use this as an area for pots but the rocks are hard to walk on. I need something to keep out weeds in this growing area. Should I get rid of all the rocks and put down nursery cloth with granite dust on top or keep the rocks and add granite dust on to to make even. Thank you for any ideas. I wouldn’t put anything over the ground cloth, eventually it might need replacing. Don’t do anything that is going to impeded the drainage under the pots. The gravel would be great if it were level enough. Hey Mike all you need to do is to ensure that the sand is moist before you check to see if they are rooted. By doing this the roots wont get damage when you pull.You need to be gentle as well. I hope this help. That comment was meant for Darrell. Hi Mike, thanks for the great videos. I have been gardening for a long time, but still have a lot to learn. I want to congratulate you on the weight loss, you look so much younger! Don’t give me too much credit, keeping it off is a battle that I am not doing well at, at least at the moment. What kind of sand do you use to stick your cuttings in and where do you get it? It has to be a coarse sand. We use silica sand, but you can’t find that everywhere but you can find a coarse sand. Usually ask for concrete sand or sharp sand. A sand and gravel yard is the best place to find such a thing, but most bagged sand from a big box store will work. I would say yes, and leave the outside. But to be sure google seed germination database for detail on exactly how to do them. I live in Phoenix Arizona where heat is usually a challenge too grow and propagate. I have tried propagating lantana and vinca but most do not survive. Can you put out a video or email best practice for these two plants. Even in coastal California I have a problem with the heat. Try draping a piece of floating row cover over the cuttings. Johnny’s Seeds Cataog has a good product at a great price. Question; can you root Bougainvillea cuttings in sand under Intermittent Mist and what is the best time of the year to do so. 1…Can Is till take cuttings from my June-stuck RCs? 2…Should I leave the June=-stuck RCs in the sand bed over Indiana winter or pot them now? Judii, I’m sure you still can. You can pot them now or leave them until spring, either way works. Ok Mike, it’s me again. I just read all your replies and know what I have to do. I have to pull all my cuttings out of the sand (where I guess my head has been), drill some holes, and start again. Do I put some screen or something on the bottom before putting in the sand to keep the sand in? Also, I have a snap on lid but don’t think my lid is “air tight”? Should it be? If it’s not tight, should I put Saran wrap across the top to hold in moisture? Bare with me, dear, I’m new at this stuff! Just answer my few questions, please, and I promise the next time I write, I’ll tell you I have roots !! Yay !!!!! Mike, I started a “cutting” bunch in a plastic tote with a lid that I painted with white paint (as I was told!). I bought sand and filled tote with about 2-3 inches. Dipped each stick into rooting powder, made a hole with a pencil and slipped stick into hole and enclosed it in sand. Every day, I take the lid off and let it air for about 10-20 minutes. I spray periodically too. What am I doing wrong? I consider myself doing all that you say, but to no avail. One thing I didn’t do was drill holes in the bottom of the tote. Would that make a difference? Is the sand supposed to be dry, somewhat dry, somewhat moist or moist? Can you help me out here Mike. This is killimg me! Good drainage is really important when rooting cuttings. You really should try again with holes drilled. I posted a question about Japanese Maple cuttings earlier but it didn’t show. Please let us know when and how to properly take cuttings from these wonderfulkl trees. Cuttings from Japanese maples are really difficult and don’t usually produce a very hardy tree. They have to be grafted onto a hardy rootstock, thus a long time in producing one, thus the higher price. Most growers, myself included, buy them already grafted to cut down on the time it takes to produce a nice plant. If you get the chance to buy my Backyard Growing System, http://freeplants.com/wanted.htm, jump on that because all of my sources are in that. Love your videos Mike. Please let us know when is the best time to get cuttings from Japanese Maple and how to do it properly. Thanks. What type of sand are you using? Oops my email address was wrong. Sorry. What kind of sand are you using? See this on coarse sand, https://mikesbackyardnursery.com/2015/10/exactly-what-is-and-where-do-i-find-coarse-sand-for-rooting-cuttings/. I usually use dip n grow but brand isn’t all that important. DEAR MIKE, I JOINED YOUR GROUP THE FIRST TIME I BELIEVE IN 2010 ?, FOR THE $ 37.00 PLAN, MY WIFE AND SON GAVE ME FOR MY BIRTHDAY. I HAVE JOINED AGAIN FIR THE $47.OO PLAN HERE IN THE LAST 2 MONTHS . A WAY TO PROVIDE THE EXTRA INCOME WE NEED ,AS WELL AS A WAY MY SON AND I CAN WORK TOGETHER AND MAKE THIS A FAMILY PROJECT AS WELL AS A WAY TO HELP WITH RETIREMENT INCOME, AND ALSO A WAY TO HELP MY SON AND I LEARN HOW TO ESTABLISH A BUSINESS WITH UNLIMITED POSSIBILITIES I WOULD BE OPEN TO ANY AND ALL ADVICE YOU WOULD BE WILLING TO SHARE, AS WELL AS TO WORK TO OBTAINE THE FUNDS NECCASSARY TO PURCHASE EQUIPMENT ..ECT. I HAVE BEEN A GROUNDS KEEPER FOR 1/2 OF MY 53 YEARS, BUT AGE HAS SLOWED ME DOWN,AS WELL AS THE BODILY INJURIES . I AM NOT VERY COMPUTER SAVY, BUT AM LEARNING MORE, SINCE THE COMPANY I HAVE BEEN WORKING FOR THE PAST 15 YEARS HAS OFFERED AND I ACCEPTED A SECOND SHIFT SECURITY POSITION NOW. HAVE GARDEN SPACE, RECYCLED WOOD TO BUILD ADDITIONAL BEDS AND PVC PIPE, 1/4, 1/2, 3/4, 1” BLUE HOSE, AND CLEAR HOSE FROM A MAPLE SYRUP PRODUCING FARMER WHO WAS REPLACING HIS LINES WITH NEW FOR HIMSELF AND WAS THROWING THIS AWAY IN HIS DUMPSTER. MAY HAVE A WEBSITE DOWN THE ROAD BUT , I WANT TO LEARN FROM THE GROUND UP AND DO IT RIGHT FROM THE START AND FOLLOW IN THE FOOTSTEPS OF A SUCCESFUL INDIVIDUAL AS YOU HAVE BEEN . I FEEL LIKE HOW YOUR STORY STARTED, HAVING IRS TROUBLES ,AS WELL AS WIFE SPENT WEEK IN HOSPITAL THIS PAST DEC. AND MY WORK INSURANCE DID NOT COVER HER MAJOR EXPENSES SINCE AT THE TIME SHE ONLY HAD PART A WITH HER DISABILITY, AND NOW TRYING TO COVER THE COSTS AS BEST AS WE CAN AND ARE PAYING EVERY ONE A BIT EACH MONTH. ENOUGH ABOUT THAT I AM EXCITED TO BEGIN , AND DEVELOPE NEW SKILLS TO THE BEST OF MY ABILITY, AND WILL DOWN LOAD THE INFO WORKSHEET FROM THE SIGN UP ; AND LET ME KNOW WHAT THE NEXT STEPS I NEED TO TAKE. THANK YOU FOR YOUR HELP , AND PATIENCE, I KNOW I GET WORDY.I HAVE BEEN WATCHING AS MUCH AS I CAN ,WHEN I CAN AND HAVE TRIED TO MAKE SURE I HAVE NOT LOST ANY OF THE E-MAILS SENT TO MY WORK COMPUTER, THEN FOREWORD HOME. TO READ IN DETAIL. LOOKING FOREWARD TO GETTING STARTED AND WORKING WITH YOUR ENTERPRISE, LET ME KNOW HOW TO GET GOING, AND APPRICIATE YOUR HELP IN ANY WAY YOU CAN, MY WIFE SAYS THE ” LORD” DID NOT GIVE YOU THE ABILITY TO WORK WITH SOIL , AND MAKE THINGS GROW ; IT’S BEEN IN MY HEART AND SOUL TO BE A “FARMER” SINCE I CAN REMEMBER, THATS ALL I HAVE EVER WANTED TO DO , WAS WORK WITH THE SOIL.!!!! This is going to sound way too simple, but the way to get started is to simply get started. You have my products. Step one, root some cuttings. Which method you use does not matter, most importantly get started. When you get a chance to get into the members area, jump on that. What you can learn in there in just a few days is mind boggling. Good luck! Most importantly take action and never look back. You can do this. Plastic tote, sand, holes for drainage or soil? Any particular soil? I really would like to “chat with you” instead of waiting for your reply!! This is a big thing! I’m trying to propagate this particular Camellia plant that no one seems to be able to name for me! Sand or a light fluffy potting soil, either one will work. Put slats under the container to make sure it can drain, lots of drain holes. Place the container in the shade. Stick as many cuttings as possible, not all will root. The more you stick the better your odds. Some things can take 8 weeks or longer. If I were to start a bunch of cuttings, can I use a plastic tote container with a lid? AJ, you can and should use the lid, check once a week to make sure there’s still moisture in and around the cuttings. Mike, how often and for how long per instance are you misting? I’m just getting into you and your systems so I have questions. I live in SW Florida and have lots of sand. how do I get things to grow in the sand? I have spent hundreds of dollars and have things never grow, or die within two years. I feed and water so I don’t really know what else to do. I know you are in Ohio and that isn’t the same but do you have any ideas that I can try. I want to get a little something going on a small scale to make some side money with out going into huge debt. Many growers, many of our members and myself grow in containers. Containers need a lot of water, but in the container you can use a medium that has more nutrition and retains more moisture. Florida really is a great place to grow plants. We have a number of members down that way that do really well with this. We lived at Lake Tahoe in California for 10 years and had sandy soil, mostly decomposed granite with very little humus. We had to compost and add manure to get things started, but eventually had a lovely garden. Just more work! Most plants love a well drained soil and when you add some rich compost, that makes it perfect! For rooting cuttings we aren’t looking for top growth so don’t enrich the sand. I need to make cuttings inside. Was going to put some sand in a plastic shoe box and place my cuttings in there. Will keep the lid on loosely. Is this going to be an acceptable solution to creating seedlings? This can work, but sooner or later those plants need to be outside. Mike, I tried rooting wine and roses weigela cuttings with the powder type two months ago. Kept them watered, but not to much water. Kept them under a see thru fiberglass awning out of the sun. I pulled a couple today after noticing the leaves had dried out. No roots! Any suggestions? Mike, I was asking about my cuttings, but you chose not to answer. They are for my own yard or giveaway. I never planned on selling any plants ever. I’ve been giving my family and friends plants for over thirty years. I was just wondering what I did wrong. You’ve answered posts before mine and after mine. Is it because I stuck up for you on the Roundup blog? I do my best to answer all the questions that are posted, but sometimes I miss a few. I’m an extremely busy person, a ton of stuff going on all the time. If I missed your question I’m sorry. I’d be happy to answer it for you if you post again as long as I see it. Honestly? I don’t see them all. Wish I could, but I’m only one person with a very busy life. I realize you are very busy, sorry about the post. I was just asking what do you think may have caused the leaves on my weiglela cuttings dry out. I kept them watered, but not to much water. I also kept them out of direct sunlight. I used the powder type of root hormone in potting soil. I would love to see a 4th video, what to do when the cuttings are rooted. When do you move them? How do you care for them? Can you leave them in the cutting bed to long? Last year I got some cutting to root but then I got excited and planned to soon. They hardly had any roots. This year I took some soft wood cuttings and have had them in a basket with sand and white garbage bad over them. They have been in there 2 months, they look good, but hardly have any roots. Right now I have thousands of cuttings rooted and they have to stay right in the sand bed until probably next summer. I have no where left to put them once potted up until I sell a few thousand plants. I still have cuttings in the sand from last summer. We’re potting many of those this week, but probably don’t have room for them all. We’ll have that video posted in a few days for sure. Is it possible to root a hybred rose cutting? I have a beatuful rose that changes color as it blooms. I don’t know what kind it is, but it’s probaably a hybred. I’ve tried to root cuttings numerious times, just won’t work for me. Mike, we really enjoy watching your videos. I want to thank you again for making learning such a wonderful experience. I recently bought the Backyard Growers System. Lots of great information. Love it. Thanks for everything you do Mike. I came across packets of Osmocote at a local box store. I know you recommend the Osmocote 14-14-14. These are the 18-6-12 (9 month). Would these be okay to use instead of the 14-14-14 for containers? They are on clearance so it would be a considerable savings plus no shipping. Those are fine because they are Osmocote. More nitrogen but it releases for over a longer period of time. What about rooting rose cuttings as I prune my rose bushes? A few years ago, I planted some cuttings after putting some powdered root tone on the bottom and out of 6 cuttings, only one cutting survived. Roses can be rooted but they have to be shaded and watered daily. Love your show! Where can I get a pair of shears/ snippers that you use. I’ve had several but none work as quickly and cleanly as yours. Maybe you should sell Mike’ Tools. I’ve owned a lot of pruning shears in 40 years, I’m really hard on them because I use them as pliers, hammer etc. because they’re always in my pocket. Without a doubt, this Corona 3160 Bypass shear is the best I’ve owned, and the ideal size for pruning and cuttings. Thanks for all your how to videos. I just took cuttings using your plastic container filled with sand and garbage bag technique. My question is what comes next after they root? Do I leave them in sand all winter or pot up or stick in a bed? I’m in Southern Illinois so winters are about the same as yours. Thanks for all your help. I would be super interested in a video about after they root as well. Could you make sure to show a rooted cutting to show how many roots are needed before re-potting please? We just shot that video today, it should be on the site in the next few days. It’s one of our “Mondays with Mike” videos. I too cant wait for this video! Thanks! Do you run the misters at night, in your cutting bed? I turn them off at night, lots more details in the video that comes with the system. Once I have a root how long to I wait until I plant it? Soon as I can or do I wait until next spring and keep it in the house all winter? Travis, early fall is a good time to transplant rooted cuttings into the garden or you can wait for spring, but do not keep them in the house over the winter. Freezing won’t hurt them as long as they don’t dry out. I believe this answer 1 ques, winter watering how often? Of course the answer is as needed. The needs are very different for hardwood and softwood cuttings. I use shade fabric for shade. Is this too much? I have a 8 x 16 ft “baby house” covered with the shade fabric. Also have some small rooted cuttings that I have old fencing covered with shade fabric. Am I providing too much shade? The amount of shade that you have is probably fine for rooting cuttings. I have been following your posts for a couple of years but, until now, I have not made any cuttings. On July 2nd I rigged up a makeshift area and put in about 200 various cuttings. I can’t wait to see if they root. I will be taking more cuttings from my landscape in a day or two. I have lots of parts and pieces to a watering system similar to what you use, but I need a timer for it. I have no power to this building so I need it to be battery operated. Do you have any suggestions. I am sure I could fix up something workable with the parts I have if I had a timer. Thanks for all the valuable information you provide. I will be offering a battery operated timer at a later date, I just don’t have them right now.